This is a bottle that is 22fl oz, or 650ml, and it has beer of 6.4% ABV, 60 IBU things, making it 3.28 standard drink units in NZ, and around 350 calories in the bottle. 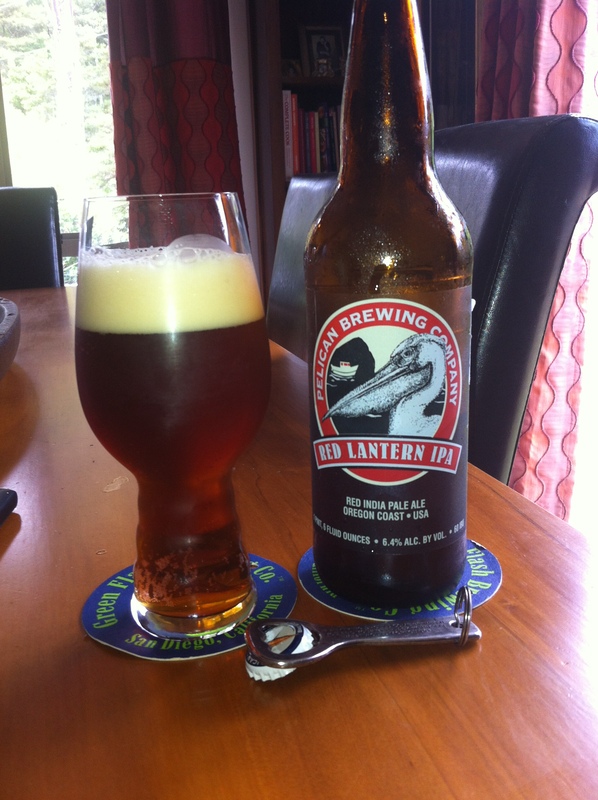 Just as red lanterns were once used to guide fishing boats to home base at the end of the day during foggy winter weather, our Red Lantern IPA is the perfect way to end your winter day. Born from our brewer’s love of hops and craving for a deep caramel backbone, the rich red color and medium body delivers just the right balance. Copious amounts of El Dorado hops give Red Lantern a clean hoppy finish. Website says that this is a seasonal beer available in December, so either this is a bit fresh or a year old, what could go wrong! Big fresh pine hops aroma and a lovely hiss as I popped the cap on this one. It is much lighter than a ‘red’ might be, deep chestnut and a lovely yellow tinged fluffy head. It does look the biz. Aroma the same in the glass, strong pine hops. ~gosh~ that’s potent and loud and a full nice beer. Somehow I have a beer that seems to be a the right temperature and in peak form. Go me! Bitterness is not apparent up-front, it’s more in the middle with the malt backbone and a dazzling bitter finish that just sings a bit. 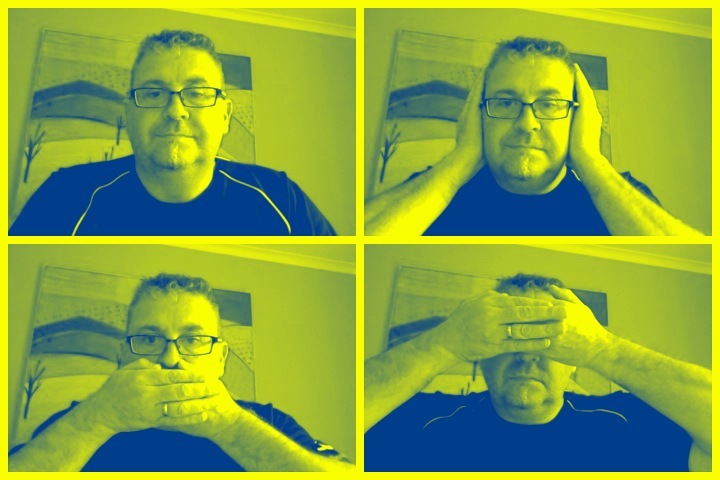 Standby for poetic ramblings. So I’m dazzled by a red beer, which doesn’t have the appearance or depth of colour to be ‘red’ but has a bunch of flavours and burst that does make it a really good IPA. The pdubyah-o-meter rates this as a 9 of its things from the thing, which is a really good score, particularly for an IPA in a field where there are a lot of IPA style beers. I haven’t enjoyed a beer this much for a while, just for the enjoyment of drinking it and the reward for the flavour layers that it has, just for the beer it is, not a thirst quencher or something to pass the time by, but a beer that has an engagement. Reminds you what a good IPA should be like. Am I enjoying it? It really has made me smile and brought real enjoyment to my day. Would I have another? I’d love another, or two, this would be a great beer for an evening. Would I share with a friend on a porch and set the world to rights? Yes I think that it has enough bitterness, hops and malt softness to keep everyone happy, it is also easy drinking without harsh edges. Musically not even Red but an album called “Blue Planet Eyes” from a group called “The Preatures” This is a track called “Somebodys Talking”. The Preatures are an Australian 5 piece band from Sydney, New South Wales. 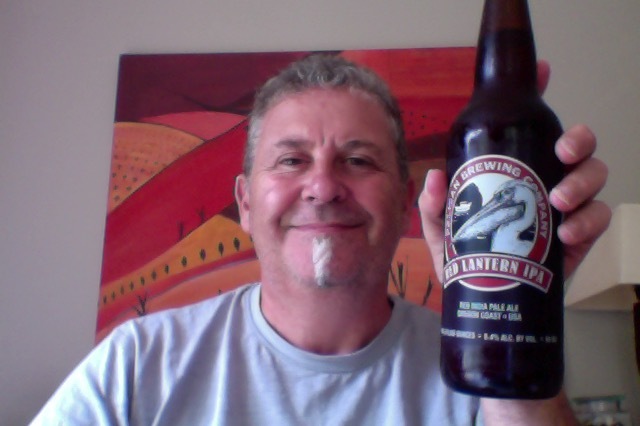 This entry was posted on February 8, 2015 by Philip Walter in Beer, Beer of the USA, Beer Review, Craft Beer, Critic, India Pale Ale (IPA), Pelican and tagged Alcohol by volume, Beer, craft beer, India Pale Ale, Pelican Pub & Brewery, Pelican Red Lantern.